2nd Avenue NW in Calgary, Alberta, is a mixed use area that runs through the Kensington neighborhood in the city. One section, between 10th Street NW and 9a Street NW, across the river from central downtown Calgary, is in the process of becoming a model site demonstrating how a dense, commercial street can actually manage stormwater directly on-site using trees and soil as green infrastructure. This prototype project – which started as an urban design project more narrowly focused on walkability issues like expanded sidewalks and lighting and seating components — will now demonstrate what truly green streets throughout the city can be. The project was installed in summer of 2013. Most of the rainwater that falls in the City of Calgary drains directly in to the Bow River. But before it does, it flows across city streets, sidewalks, and parking lots, picking up dirt, pollutants, and heat from paved surfaces. The city has no sumps in their catch basins, so all of these pollutants are deposited directly in to the river without any treatment, impairing the quality of this central and iconic body of water. The 2nd Avenue Streetscape project took an ordinary street and use vast quantities of soil beneath the sidewalk to turn it in to a green workhorse. It is the first project in the city to integrate tree growth and stormwater management in same site. The design of the site itself is clean and simple. 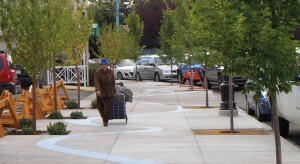 The sidewalk will be wider, and Kestrel has taken advantage of more space to plant as many trees as possible. Contemporary detailing and high quality concrete paving will update the streetscape, providing a stepping stone for design improvements for future projects in the city.